Exchange Traded Funds are passive investment vehicles. The most popular funds on the Australian Stock Exchange run by State Street and Blackrock track a particular benchmark like the ASX 50 or the ASX 200. It is the most effective tool in the eternal struggle between active and passive management of investment assets. There has been a trend to develop these products beyond its historic role as a passive index funds. At first the introduction of smart beta funds which are essentially a portfolio of stocks that has been selected based on specific investment factors gained traction. The most recent trend is Active Exchange Traded Funds. Active ETF can simply be considered managed funds that are traded on the exchange. Similar to Listed Investment Companies which is just a listed close end funds started with a fixed amount of capital. Active ETFs are open ended funds. The total size of the portfolio will change based on investor capital inflows and outflows akin to its index fund peers. Actively managed exchange traded funds can be a viable if the fund outperforms a particular benchmark. But this has been the key factor driving investors towards passive management, most active funds after fees have not been out performing the benchmark. The growth in passive investing is result of many investors giving up on active management. 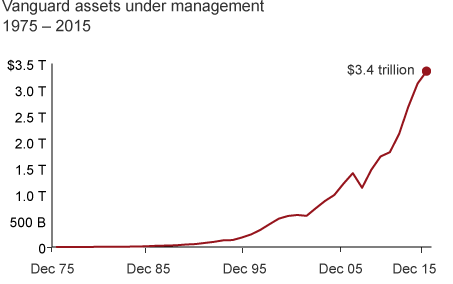 The chart below shows the growth in Vanguard Assets Under Management over the 3 decades. The growth in AUM is hand in hand with low fees where the average fees for its funds is only 0.18% per annum. The shift towards low cost index funds is effectively investors voting with their wallet. We are by no means great cheer leaders of passive management, we are active investors first and foremost and consider it to be the best means of creating value over the long run. But active investing is not for everyone. For most of the population passive funds is the most efficient means of allocating capital, putting aside the fact the growth of passive capital can in some instances create distortion in the market in which the capital allocation is effectively blind. We consider the creation of active ETFs as a rear guard action in stopping the outflows. However until the underlying driver of investors moving from capital from active to passive is addressed, i.e too many funds under perform their benchmark and failed to add value. Passive investing will continue to eat active management’s lunch.